As agreed by China and Russia, as the Special Envoy of President Xi Jinping, State Councilor and Foreign Minister Wang Yi will pay a working visit to Russia from April 4 to 5. Q: According to reports, US Ambassador to China Terry Branstad said in an interview recently that China should not take retaliatory measures aimed at imports of American soybeans. What is your comment? A: We all know that Ambassador Branstad comes from an important agricultural state of the United States. As such, it is understandable that he concerns himself with the interests of American agricultural workers. In fact, we have seen that the US agricultural industry, among many other sectors and industries, have expressed their concerns recently over worsening China-US trade ties due to the US government's unilateral measures. As to whether China should target soybeans as retaliation in the future, I think you need to make out the fundamental difference between trade and trade war. To be specific, trade is based on consultation. In contrast, a trade war, once waged, will force the other side to take countermeasures at a certain point and in a certain way and field based on its own interests and needs. As we stressed many times, China doesn't want a trade war. In the meantime, we also stated that if forced into a trade war, we have every strength and confidence to safeguard our own interests. We hope that the US decision-makers will heed the call of American consumers and relevant industries and weigh the possible gains against losses once they take the unilateral measures which should not be taken. It's wise for one to turn back before running into a blank wall. Q: According to reports, China said that the Tiangong-1 space laboratory is supposed to reenter the atmosphere on March 31. Does China know yet where exactly it may reenter the atmosphere? Does China expect that it may have any impact upon any part of the world where it might fall? What communications has China had with other countries on this? A: With regard to the specific information, I may refer you to the websites of China Manned Space and the United Nations Office for Outer Space Affairs. 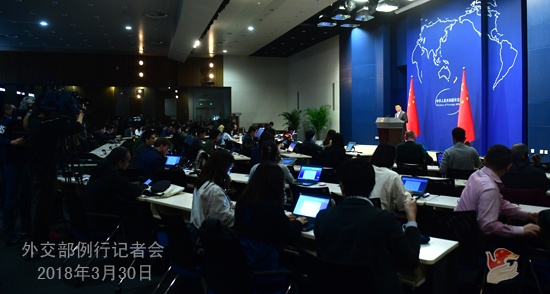 China attaches high importance to the reentry of Tiangong-1 into the atmosphere and has been handling it in accordance with relevant international conventions and practices and with a high sense of responsibility. China has reported relevant situation to the United Nations Office for Outer Space Affairs many times and kept the information open and transparent. We will communicate with relevant countries if necessary. Q: According to reports, the Russian Foreign Ministry announced on March 29 that it would expel 60 US diplomats and close the US Consulate-General in St. Petersburg. The White House said that the decision would deteriorate US-Russia relations. What is your comment? A: We have noted that the decision made by the Russian government yesterday is the continuation of a sequence of incidents that happened recently. Over a period of time, the Russia-US relations have met with some difficulties. I would like to stress that both Russia and the United States are two major countries with important influence in the world. What needs to be mentioned is that they are also two permanent members of the UN Security Council which shoulder important responsibilities for world peace and security. We sincerely hope that Russia and the United States can properly resolve their differences through dialogue and consultation on the basis of equality and mutual respect. Q: Next Monday, Zimbabwe's President Emmerson Mnangagwa will kick off his state visit to China. What outcome does China expect to achieve through this visit? In addition, we have noted the reports saying that Zimbabwe's largest hydropower station constructed by a Chinese company since its independence was completed yesterday. What is your comment? A: At the invitation of President Xi Jinping, President of the Republic of Zimbabwe Emmerson Mnangagwa will pay a state visit to China from April 2 to April 6. China and Zimbabwe enjoy traditional friendship. 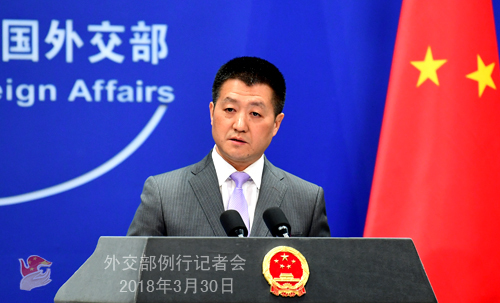 Since the establishment of diplomatic ties, China-Zimbabwe relations have been growing in a sound and steady manner with frequent exchange of high-level visits, fruitful outcomes reaped in cooperation across the board and close communication and coordination in international and regional affairs. China values developing its ties with Zimbabwe. We are willing to work with Zimbabwe to further elevate China-Zimbabwe relations and deliver greater benefits to the two countries and two peoples. We are convinced that President Mnangagwa's visit will inject new impetus into the development of China-Zimbabwe relations. Regarding your second question, the expansion project of Zimbabwe's Kariba South hydropower station funded and constructed by China is one of the important outcomes of China-Zimbabwe pragmatic cooperation. After its completion, the project will play a positive role in increasing Zimbabwe's power supply and promoting its economic and social development. China is pleased to see this. Actually, the Kariba South hydropower station is one of the many cooperation projects between our two countries, which fully demonstrates that China's investment and financing cooperation with Africa has substantially fueled the projects of production in African countries, yielded sound economic and social benefits and been widely welcomed by the African countries and their people. Q: In terms of China-aided construction projects in Africa, they are not all infrastructure projects such as hydropower stations. There are also some other projects including the new Economic Community of West African States (ECOWAS) headquarters and the parliamentary buildings in Zimbabwe. Why does China decide to undertake the new ECOWAS headquarters project? Will it result in China enjoying more political influence in West Africa? What is your comment on those criticizing China's motives? A: The Economic Community of West African States (ECOWAS) is an important sub-regional organization in Africa which has made important contributions to upholding regional peace and regional economic integration. We always support ECOWAS in strengthening capacity building and playing a bigger role in the cause of peace and development in West Africa and the whole African region. In fact, this also constitutes an important part of China's support for Africa's pursuit of strength through unity and regional integration as well as its peace and development cause. As is known to us all, poor infrastructure is one of the main bottlenecks choking Africa's development and progress. The infrastructure projects constructed with the assistance of China are welcomed by African countries and their people. The construction of the new ECOWAS headquarters you mentioned was aided by the Chinese government at the explicit request of the organization. As for the groundless accusations of certain Western media, I can only say that they are measuring other people's corn by their own bushel. I don't know whether you have noted that Namibian President Hage Geingob, who is now on his state visit in China, said yesterday that China has never colonized or looted Africa, and always treated small and medium-sized African countries on an equal footing. China lent support to Africa's just cause in the past and is now helping Africa to develop. China is the sincere partner and friend of Africa, and African people are opposed to those groundless accusations against China. I think that we'd better lend our ears to the voice of the African people. Please rest assured that the noises will not shake the determination of China and Africa for solidarity and cooperation, neither will it prevent us from forging ahead hand in hand. Q: Beyond Africa, China over decades has been funding, designing and perhaps even constructing projects in many countries throughout the world. What is the overall aim of China's overseas building efforts? How does it help China's foreign relations? A:Just as President Xi Jinping pointed out when holding talks with President Hage Geingob yesterday, in the era when China was not well-off, Chairman Mao Zedong and other Chinese leaders of the older generation said that we would lend support to Africa against all odds. Now China is developing rapidly, so in view of both our brotherhood and China's economic strength, we should step up our efforts to offer assistance to Africa. It goes without saying that supporting the African countries and other developing countries in enhancing their capacity building and achieving common prosperity still remains an important aspect of China's diplomacy. We will continue with our efforts to conduct mutually beneficial cooperation with developing countries in accordance with their own will so as to achieve common development and jointly build a community with a shared future for mankind. Q: According to reports, satellite images earlier this week showed that the Liaoning aircraft carrier took part in a large carrier group formation in the South China Sea with about 40 other ships. What is the purpose of this exercise? A: The spokesperson of China's Ministry of National Defense has responded to this question at yesterday's press conference. The Chinese navy's combat exercise in the South China Sea was a routine arrangement included in the annual training program. You may read over the transcript of the Defense Ministry's press conference. Q: Yesterday you announced that from next Monday, member of the Federal Council and head of the Federal Department of Foreign Affairs of the Swiss Confederation Ignazio Cassis will visit China and hold the first round of China-Switzerland Foreign Ministers' Strategic Dialogue. What topics will the dialogue focus on? What are China's expectations for it? A: During member of the Federal Council and head of the Federal Department of Foreign Affairs of the Swiss Confederation Ignazio Cassis's visit to China, State Councilor and Foreign Minister Wang Yi will hold the first round of China-Switzerland Foreign Ministers' Strategic Dialogue with him, which will help to promote the establishment of China-Switzerland high-level innovation platform. According to my information, besides Beijing, Mr. Cassis will also travel to Shaanxi. Presently, China-Switzerland relations enjoy a sound momentum of growth. In 2016, our two countries established the innovative strategic partnership. At the beginning of 2017, President Xi Jinping's state visit to Switzerland achieved full success and elevated China-Switzerland relations to a new level. It is one of the important consensus reached by the two heads of state during President Xi Jinping's visit to Switzerland to set up the Foreign Ministers' Strategic Dialogue mechanism and promote the establishment of the high-level innovation platform. China attaches importance to developing its ties with Switzerland. We are willing to work with Switzerland to follow the spirit of mutual respect, treating each other as equals and win-win cooperation to continue further advancing our innovative cooperation in various areas so as to deliver greater benefits to the two countries and two peoples. Q: What are the chances of the debris of Tiangong-1 falling onto the ground when it is burnt up on reentry? A: As I said just now, China attaches high importance to the reentry of Tiangong-1 into the atmosphere and has informed the United Nations Office for Outer Space Affairs of relevant situation in a timely manner. As the time for the possible reentry of Tiangong-1 into the atmosphere approaches, China will adjust its pace in keeping the United Nations Office for Outer Space Affairs posted as needed. 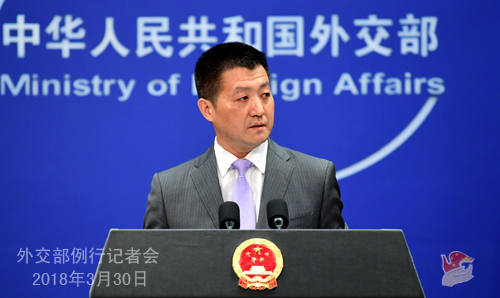 With regard to this issue, China keeps the information open and transparent with a high sense of responsibility. We will also contact relevant countries in a timely manner if necessary, like what I said just now. Regarding the specifics you asked about, I'm not quite clear about them given they are something very technical. I will refer you to the websites of China Manned Space or the United Nations Office for Outer Space Affairs.